My very first introduction to learning AdWords was through multiple videos, which comprehensively explained the whole process from setting up a campaign to its ongoing management. Sitting down and watching how all the individual components of AdWords worked together to create the 4-line ad we see on Google was definitely overwhelming. There were so many different terms to learn and settings that could be fiddled with that, as a first time user, AdWords seemed scary. It wasn’t until I was thrown into the deep end and assigned some campaigns to manage that I began to understand how it all fits together. Although at that early stage I was nowhere near to being good at AdWords, let alone a Guru like the rest of the team, I started to pick up how AdWords worked in practice and the implications of certain decisions. Managing multiple campaigns when I still didn’t fully understand the difference between conversions and converted clicks, was difficult but it was the best way to learn. AdWords has so many different components, some intuitive, some not. The most difficult aspect for me to learn was how to set up an effective campaign. This process seems deceptively simple – find keywords, sort those keywords into ad groups, and write the ad copy. However, in order to do these steps effectively, you need to fully understand what the company is about and how your target consumer thinks. If you don’t understand what products or services the company is offering or what words consumer use to search, then it’s going to be difficult knowing which keywords are relevant and how to write effective ad copy. AdWords also has specific terminology that is used when talking about all aspects of producing an ad. For most first time uses it can be difficult to get your head around all the different terms, however like most things, with experience these terms becomes more familiar. The AdWords interface makes learning all the terminology easy by having question marks near each term which, when hovered over, comes up with the definition as well as links to find out more. The AdWords interface, and the whole Google scene, is constantly changing and evolving to make the user experience more enjoyable. This requires us, as aspiring marketers, to stay up to date with all changes and be ready to react. Just recently, Google announced major changes to the Adwords interface and key reporting metrics. It is important to always be on the look out for whispers of change within not only the marketing world, but also general trends in the wider society. To keep up to date with developments, I have made a Feedly account, which brings together a range of blogs onto one platform. These blogs, written by marketing professionals, are great in sharing tips and tricks in managing campaigns. Subscribing to several marketing blogs definitely helps me to keep track of the ever-changing world of AdWords and marketing. Effective advertising with relevant search results for user, better leads for business. Google Ads will now have 2 headlines, each with 30 characters, and a long description of 80 characters. That is 50% more ad text to display information about the product or service. The reason for this change is that Google’s research showed the longer ad headlines helped people identify the information they needed better and they could then click on links most relevant to them. This is a win-win for both – advertisers and customers. While customers find what they are looking for more easily, advertisers get more relevant leads with a greater potential to improve their conversion rates. That means fewer dollars lost to clicks that won’t convert. For the user, who is Google’s primary customer, search results are more accurate. It also delivers a better user experience with uniform display across all devices, desktop, tablet and mobile, benefiting both the user and the advertiser. While all new ads would have to be in the new longer text format, older ads with the shorter text will run until October 26, 2016, to give businesses time to make the transition. Google had announced it would be making this change at the Google Mobile Summit in May. It is a part of Google’s move to the Mobile First platform. Use A/B testing to test a few different versions of the longer text ads for each ad group. This will give data on wording that works the best. Work on the headline – it is now the key factor of great click-through rates and conversions. Google’s Adwords creating tools as well as other software have already made changes to support the longer text format. These changes will involve a fair bit of work for campaigns currently running ads based on several ad groups. Expect to put in a few hours of work for each ad – copywriting, testing and tweaking the ads. It’s well worth the effort, because if you get the new copy right, the ads will be better targeted and should result in higher conversions and a better cost per conversion rate. In a related development, Google is making life a whole lot easier for advertisers and small businesses. In making an ad, an advertiser has to submit a 25 character and 90-character headline, a 90-character description and image and a URL. Google’s responsive ad tool will then design and render ads that fit perfectly across the Google Display Network (GDN) and also across two million apps. This is a big move for advertisers as it will unlock native advertising, which is often more effective as it matches the look and feel of the content the user is viewing. The beauty of digital advertising is that real time data tells you what’s working and what’s not. And that enables advertisers to move their allocation across a range of advertising options. Now you can tweak your spending across devices as well. Businesses, based on the product or service they sell, will have a different traffic rates coming from desktop, tablet and mobile. Or they may have different kinds of content being accessed based on the device the traffic is coming in from. To allow advertisers to fine tune their spending to device specific traffic, click-through rates and conversion, Google has introduced device specific bidding on AdWords. A good digital marketer should be able to use device-specific bidding to improve the conversion funnel. Finding the right formula may need a bit of experimenting, but the move greatly improves the potential for businesses to maximise gains from their ad dollars. Last night, at its Performance Summit in San Francisco, Google announced that advertisers would soon be able to make individual bids for Google AdWords for desktop, tablet and mobile. This is in response to internet usage trends globally. According to Google, they now handle trillions of searches, up from 100’s of billion very recently. Over half of these searches start on a mobile device. It’s not news that mobile usage has been growing. As Sridhar Ramaswamy, the head of Google says “it’s not an evolution, it’s a revolution.” So, what Google has announced is not just device specific bidding, but now advertisers can use mobile bidding as the base, making bid adjustments for mobile and desktop. This makes mobile advertising the baseline for those who have already made the shift. 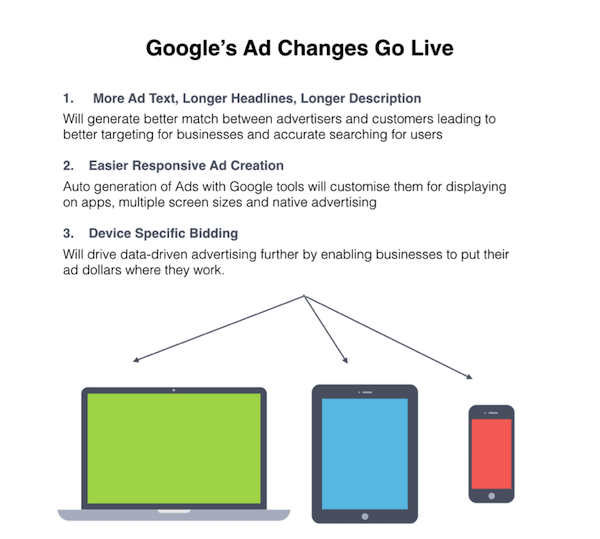 In line with this change will be big changes for business-especially in the way Google Ads are displayed. They will be much more prominent. For starters, the character count of the headline will go up from one 25-character headline to two 30-character headlines, and the description line will go up from two 35-character descriptions to a single 80-character description. This will enable better-written ad copy, rather than a few phrases strung together. It will also unify the experience for users across devices. So what does that mean for advertisers and businesses? It’s not enough to accommodate mobile searches in your marketing plan. You have to start thinking ‘Mobile First’. 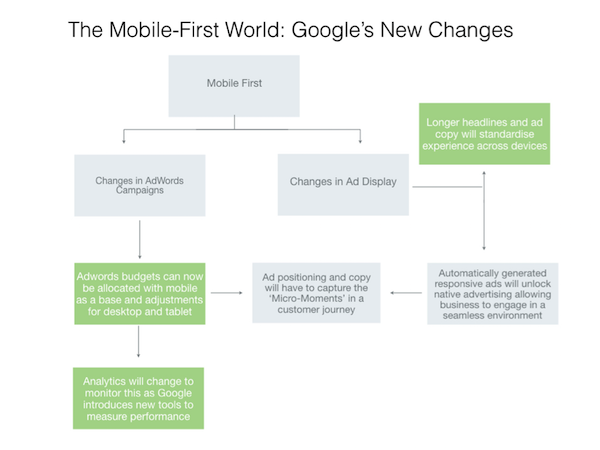 The changes made by Google will now allow advertisers to make individual, device-specific bids for AdWords. So businesses can now allocate their marketing dollars based on the device share of their audience. Keep watching that device break-up for your audience. You can expect mobile to consistently grow. While you start making the shift to the ‘Mobile-First’ world, remember that a typical browsing session is only 70 seconds long, and it’s important to understand customer intent. Can you cash in on the key moments? It is speed-dating and you don’t have much time to make an impression. Google has changed its search result page, removing ads from the right-hand side and replacing organic results with more paid search listings. You probably noticed the change already, when you search on Google, you will no longer see AdWords advertisements on the right-hand side of the page. Wedged between the paid ads are a few organic search results. This is further proof that the new search wars will be fought on mobile devices. The total number of ads on the page has dropped from around 10 to 7. This will make the competition for AdWords increasingly fierce and expensive. Also, what is not known at this stage is if customers will see as much monetary value in ads at the bottom of the page as the right-hand side. Google has currently said that the two exceptions to the “no ads on the right” rule are Product Listing Ads (PLA) and Knowledge Panels. Over the next few weeks, Google is expected to tweak the PLAs so they could appear either on the top or on the right hand side, depending on the search term. The move by Google means big changes for small businesses that depend on organic search results for visibility. The SEO manager’s task has just become much harder. Businesses will have to very sharply identify and target their market to maintain a decent ROI. Clearly articulating the business proposition, knowing customer preferences well and using more precise keywords will be the way forward. If relevant, businesses would also do well to look at digital hyper-local marketing options. And more business will have to consider increasing the spend on AdWords. Firstly, the layout of the web page is more in line with the mobile screens. Digital marketing experts believe the change may be aimed at standardizing the advertising ecosystem across devices. Secondly, the ads on the right-hand side did have a lower click-through rate and Google’s move will certainly eliminate this. Google’s move further establishes the fact that all the action in search is moving from desktop to mobile. In a nutshell, the same number of businesses (or more) will be fighting over less, but better positioned and highly visible space. And of course, that will cost a fair bit more. At Swoop Digital, we will be watching closely for the changes and impact as the space continues to evolve. Keep an eye out for our newsletters and social media posts. AdWords: What if my competitor clicks on my ads? Last week, I spoke about Google AdWords at a Mortgage Broker workshop when I got asked if Google could tell if someone from the same IP address was clicking on his ads. Naturally the guy was worried that someone might repeatedly click on his ad which would result in wasted adspend and budget. It’s not a new question and it’s one I hear often. At $25 click for a mortgage broker, having a competitor repeatedly click on his ad could wind up being pretty expensive. Apart from the fact that you can control costs by limiting your daily budget, the good news is that Google is incredibly good at filtering this type of activity out. Here is Google’s stance on the matter. It’s serious! Google don’t disclose exactly how their systems pick up invalid clicks but I am willing to bet that repeated clicks from the same IP address may be one of the the many filters. Although there are some reasons why the same IP address might click on an ad multiple times and Google explain this here. So what does Google consider an invalid click? How do you know if you have had any invalid clicks? In the campaigns tab, you can look to see if indeed you have had any invalid clicks. One of the worst examples we have seen was a few months ago where the invalid click rate was 61.14%. Even now the invalid click rate for the display and re-marketing campaigns is over 25%. Meanwhile, Google’s system have been detecting the issue and proactively reimbursing our client for cost of the invalid clicks. If you know your competitors IP address, you can block them from seeing your ad by excluding their IP address in your campaign settings. Your challenge though, is in identifying your competitors IP address. It’s not something I personally bother with for our own Swoop Digital AdWords campaigns. It’s also not a concern for the vast majority of our clients who get great results from AdWords. In the overall scheme of things, one click from a competitor is neither here nor there. While I don’t like the thought of it, it’s pretty difficult to control the actions of others. It’s entirely possible that a competitor might click on your ad. And you will pay for the click. It’s also possible that someone might click on your ad, go away, conduct another search and click on your ad again. This is normal search behaviour. Repeated constant clicks are not normal. Fortunately Google can identify them. Want an experienced opinion on your AdWords Campaigns? Why not contact us? We are Google AdWords Partners, and have helped many businesses improve their campaigns. Should I hire an AdWords agency or do it myself? It’s a question many small to medium businesses ask. They wonder if it is worth spending money to have someone actively manage their AdWords campaign. I know paying someone else to manage a campaign can sometimes feel more like an expense than a benefit. I get it – I’ve even been there myself with other services that I use. 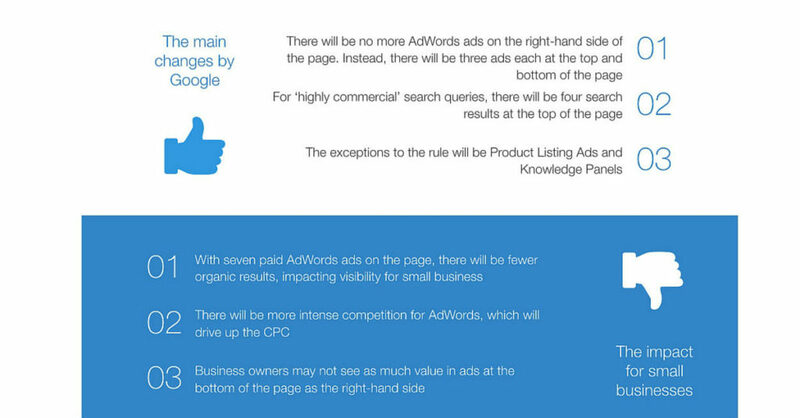 One critical thing to consider is the number of changes and innovations that Google introduce into AdWords. According to Lucinda Barlow Google’s Marketing Manager for Australia and New Zealand, over 1,000 changes were made to the AdWords platform in the last year. Think about it – that’s almost 3 changes a day! That’s a lot of change for any business to understand let alone manage. Do you really have time to keep up to date with the changes? Do you log into your account regularly to see whats going on? Or do you just sit there and let it drift along? I know for a fact that in most cases, a client will start of with the best intention to manage it themselves only to find that work gets in the way. By the time they come back to us, they haven’t logged into their account for months (until something happens). So they come back for a health check or for us to manage their campaign again. As you can see there is a false economy in managing it yourself – not only is there a time cost of keeping up to date with changes and implementing changes, there is a monetary cost. In addition, keeping track of performance is often one of the last things on their mind. And that’s where I see the key benefit of dealing with a specialist Google AdWords agency like ourselves to manage your campaign. Not only do we stay up to date with all the changes, we have a systematic process to manage your campaign so it doesn’t get left on the shelf to expire. I know from experience that, most clients who leave eventually come back because they realise they don’t have time to focus on it after all and when they do, it absorbs too much of their time. I’m not going to lie, staying up to date with all the changes is challenging. Sometimes we struggle to understand the implications straight away. Some innovations that we don’t think will impact an account do. The point is that it is checked and adjusted regularly. As a Google certified partner we are evaluated by Google to ensure we meet best practices. We also get an insight into different trends which may also impact your campaign. Things that impact your campaign are picked up early and adjusted. 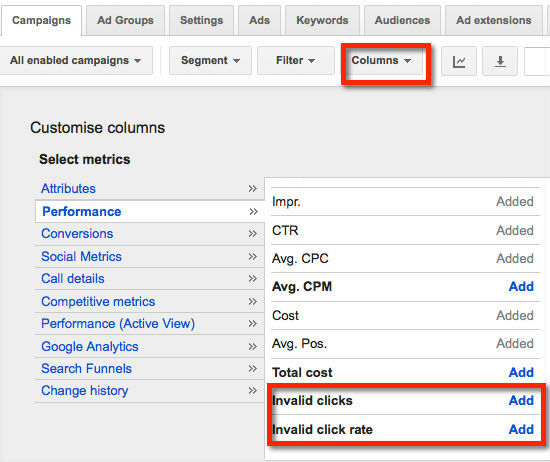 Regularly logging in to your Adwords account & adjusting a campaign to improve performance. Make small (and sometimes big) changes to your campaign. Key changes include adjusting bids, adding negative keywords, changing keyword match types and adjusting your ad copy. Like many professional services, managing an AdWords campaign is a skill that takes time to learn. If you don’t have the time to learn how to do this well, or have the tools to evaluate whether or not your campaign is working, then you’re missing opportunities to get more pound from your advertising dollar. I like to think of an AdWords service like a financial planning service. Sure I could do a financial plan myself, but researching all the available options and doing the financial modelling would take me weeks (if not months). If I left my financial plan to myself, I’d start off with gusto but it would take a long time for it to happen. As much as I’d hate to put myself in the category of a financial advisor, paying someone to managing an AdWords campaign is kind of like that. You are investing in a service to help grow your business. The only difference is that I don’t get paid a commission or rebate from Google and our fees aren’t nearly as high as the financial plan I recently paid for. Want an experienced opinion on your AdWords Campaign? Why not contact us? We are Google AdWords Partners and offer a range of services – from AdWords health checks to full service AdWords management. Does Google AdWords remarketing work? Google remarketing doesn’t work – according to a member of a LinkedIn group I am in. He’d tried it twice with two different agencies, it wasn’t profitable and also thought that as an internet user, he found remarking annoying. Remarketing isn’t magic pill that will make people buy from you. It requires a careful well thought out strategy to be effective. If you have tried remarketing before and found it hasn’t worked for you, here are some tips to get it firing. People who have demonstrated an interest in your products or services by their behaviour. For example they may have looked at your About or Contact pages, they may have added an item to the shopping cart but abandoned at the last minute. Perhaps they spent more time that normal on your site. Converters / Customer – these are the people who have already phoned you, called you or brought from you. Your segmented lists can be time, behaviour, interest, product or seasonal based. By breaking your visitors into lists you can add or exclude them from being remarketed to. A practical example of this is by advertising only to people who added something to the shopping cart and excluding the ones who actually brought from you. The sweet spot in remarketing is targeting people who leave the page before your main conversion points. Your can even overlay an audience with other audiences to make your lists super segmented. A caveat though, the smaller the list size the more difficult it will be for your ads to show. Too much segmentation can have a negative effect on your campaign if you site does not get a lot of traffic. Let’s face it, showing your ad to the same person 100 times is annoying. Just like my fellow LinkedIn member said. There are ways though to make it much less intrusive and annoying. Cap your frequency so your potential customer doesn’t feel like their being stalked. Frequency can easily be controlled in the settings area of your campaign. We’ve often found that the ideal frequency range is somewhere between 4 and 7. But there is no hard and fast rule for this. It’s important to review the reach and frequency report located under the Dimensions tab in adwords and make your decisions from there. Timing is critical in re-marketing. Showing your customer an ad a hour after they left a website is pre-mature. Carefully consider the specifics of the product and the engagement of the user when they abandoned and adjust the timing to match. Some sites, particularly mobile apps and games are good at attracting clicks but bad at attracting conversions. People playing a game or using an app are generally in the middle of doing something else. Your ad is often a distraction. If you find sites that have high click through rates and low conversions, block them. You see which sites your ad appeared by checking out the placements report. This nifty little report is located in the Dimensions tab in the view automatic placements section. You can also find it in the Display Network tab in the placements section. Look out for the sites labeled with the automatic status. Review your messaging, landing page and call to action. Put some thought into your campaign and tailor your ads (both banner and text) to encourage people back to your site. It’s a good idea to review the messaging, landing page and your call to action. Just using your normal ad inventory is lazy and doesn’t deliver a targeted message. Consider dangling a really interesting carrot to lure them back. I always recommend to try the journey as a customer yourself. It’s one of the first things we do. Think like a customer and ask yourself if you would buy if you were a potential customer. Find all the stops down the funnel and see if you can remove them. For example, people may be reluctant to buy shoes on-line in case they don’t fit. If this is an issue consider offering free shipping on returns in the re marketing ad. If you are having people abandon your shopping carts, you need to find out why first. As a consumer, I often get to cart before I can see the delivery charges. If I don’t like what I see I leave. It’s one of the most annoying things for me and I’m pretty sure I am not the only person who thinks so. Consider that sometimes, potential customers may add items to their shopping cart wish list to get an idea of what it would cost to buy all the things they want. Perhaps after doing this, they find it more expensive than what they were willing to pay. Hiring an outside agency can help as we can all become “blind” to what is wrong with our own websites. This is why it pays to work with a good agency. It’s not always as easy to workout where the influence for a click came from in the first place. So the remarketing ads might be doing their job but the click throughs are coming from different activities. it’s worth checking to see if there’s been an increase in web traffic at the time of the campaign. It’s also worth looking at attribution modelling to discover if remarketing helped contribute to a conversion even if it wasn’t the last click. Remarketing is complex. Having a well thought out strategy can go a long way to boost performance. Want an experienced opinion on your AdWords Remarketing Campaign? We know it can be frustrating if you can’t see your own ads. There are several reasons for this. Budget is often the number one reason why ads fail to show. Let’s face it, we all have a daily budget and we all need to control costs. So to manage this, Google will show your ads based on how many clicks it believes your ad will get so it can manage your budget effectively. If your ads were shown all the time and your ad was clicked on every time a user searched, you would soon go over your budget. So to manage this, Google shows your ads less frequently and distribute your ads based on your budget. A good way to determine if your budget is too low is by looking at your Search impression share and also your Search Lost Impression Share (budget) inside of your AdWords account. It may not be immediately obvious where to find this little gem. Like all things good in AdWords, it’s conveniently hidden away but can be used to quickly determine if your budget is too low at a keyword, adgroup or campaign level. To find your impression share, go to the campaigns tab, click on columns and then customise columns. By clicking on the Add Search Impr. share and Add Search Lost IS (budget) you will be able to get some insight if indeed you have a budget issue. Another reason why your ad may not show is that you are not bidding high enough for your ads to appear on the the first page of the search results. You can diagnose this by going to the keywords tab and looking at the keywords you are bidding to see if there are any messages saying that you ad is below first page bid. You should also click on the little speech bubble to determine if there are any issues. If you frequently search in Google to check your ad, then Google may personalise the results you see based on your own behaviour. If it thinks you are not going to be interested in your own ad, it might show it less frequently. Remember, Google’s aim is to show you the most relevant ads so if you continually search for your own ad and don’t click on then it thinks the ad is not relevant to you. A caveat – I don’t suggest you click on your own ads – Google doesn’t recommend it anyway. However I do recommend using the Ad Preview tool. Using it will help easily test if your ads are showing. You will get a more realistic view if your ad is showing. It will also tell why your ads aren’t showing. If your delivery method in the settings area is set to “accelerated” it means your ads will show more quickly until you reach your budget. If your budget is not high enough (that old chestnut again), then you may miss traffic later in the day. Conversely, if bidding is set to Standard then your ads will be displayed more evenly throughout the day. It’s worth revisiting your campaign settings to see what it is set up. Look out for Delivery Method (advanced) link – it’s a little bit tucked away but easy to find if you know what to look for. If your quality score is low, then Google may not show your ad at all. One factor that influences your quality score is your ad copy. If you ad copy is not relevant to the keyword, then your quality score can take a hit. Your landing page is also another factor. So it’s well worth checking that your ad copy is relevant to the keyword you are bidding on and that you are sending people to the most appropriate landing page for your ad. Having a well structured, professionally set up AdWords campaign can go a long way to help overcome this issue. Sometimes ads don’t appear because you’ve accidentally paused your campaign, adgroup or keyword. It’s a pretty rare that this happens but it is possible so its well worth checking these are enabled. It’s also worth checking that any ads in the adgroup are enabled too. So that about covers some of the main reasons why you might not find your ad in Google. We know it can be frustrating when your ad doesn’t appear. We’ve found in the majority of cases, this issue can be fixed very easily. A common way is to increase your budget but it doesn’t have to be the only way. If your budget is really limited, then splitting out your main keyword into its own campaign and allocating an appropriate budget for that campaign could also work. Does Search With Display Select WorK? 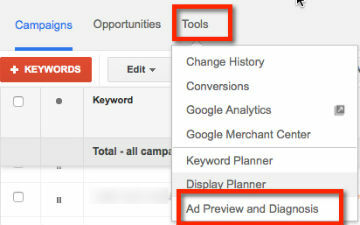 Ever been brave enough to try Google AdWords Search and Display Select? AdWords purists (ourselves included), often recommend breaking Search and Display campaigns into two unique campaigns. To test this, a client decided to “save costs” and manage their own AdWords campaign. The theory being that they could use the money saved from AdWords management and put “the savings” into the campaign so they could generate more leads (yes they used Display Select – more on that later). We duly increased their spend and ceased management of the campaign. Fortunately, the client decided to run the current campaign as it was for a while. Cost per click was higher, but the number and quality of leads had improved significantly and the overall cost to acquire a lead decreased. The only blip in the campaign was over the Christmas, Easter and School Holiday periods – a trend not uncommon for this type of industry. Things were fine until the client made changes to their account in late May and early June. Ad spend remained consistent over the same time-frame. Overall the cost per click decreased by a massive 68% and they got a lot more clicks. Not when you consider that conversions tanked in the first two weeks. Conversions did increase in week 3. However, the issue is that their number of leads dropped 30.4% and the cost to acquire a lead increased by 35%. So while the client reduced their cost per click, they spent more money on advertising to get less leads. By using the Search and Display Select combination, it cost them a massive $476.76 per lead on the Display network when it had previously had an average cost per lead of $48.40 not using Display Select. From 1st May to 14th June, quality score at an account level also decreased from 9.2 to 6.8. Had they continued professional management, the client would have gotten more leads at a lower cost even if they factored in our management fee (not to mention the cost of their time in redoing the campaign). It’s why we recommend using a dedicated specialist in AdWords like ourselves to manage your campaign. Things can easily go pear shaped if you don’t know what you are doing or how to interpret the data correctly. So lets look at what they could have done better. So there you have it. Trying to save money on AdWords management and putting extra money into your advertising campaign doesn’t always pay off. Where Is The Google AdWords Keyword Tool? Mid last year, Google retired its keyword tool. It was replaced by a new tool – the Keyword Planner. Don’t be fooled – although they sound the same, the keyword planner is quite different. You can now see search volumes at a more local level – in Australia, previously you could only see search volume at a country level – not state. This is a great bonus for local business. You can search by category – this may help you uncover keywords you may not have thought about. No ability to understand differences in search patterns between desktop and mobile devices – device targeting is now gone. With increasing searches on mobile and the rise of mobile apps this is an issue. Less visibility on potential traffic for different keyword match types – the ability to select broad and phrase match keywords has been removed. Average monthly data is calculated over a 12 month period – so this is not the place to get local search trends. In some ways there is less functionality and in others there is more. Have you used the keyword planning tool? Do you like it better? Feel free to comment below. Personally I preferred the old tool because it gave me more granular data on match type keyword volume which was handy for calculating potential search volume for AdWords. However, I do like the ability to see search volume at a city level. The keyword planning tool certainly giveth but it also taketh.